The newest motherboard based on the Intel B85 chipset by BIOSTAR is ready for work, play or to even literally make you money. The TB85 supports the Intel’s 4th generation Core i7 and Core i5 processors in the 1150 package using the Intel B85 single chip architecture. The TB85 includes many features that are useful for IT departments in larger companies as well as small firms. 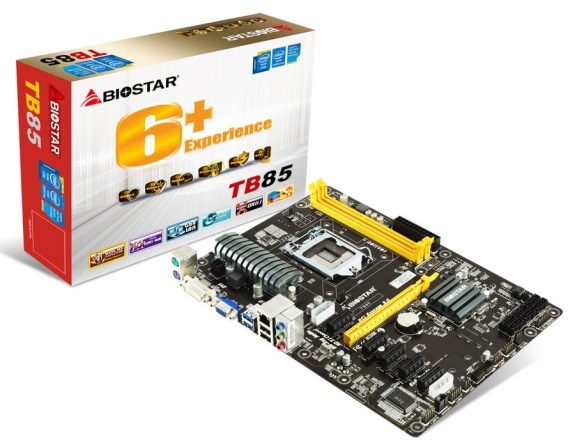 BIOSTAR’s TB85 boards deliver a business-rich option at a value price compared to the other companies. The TB85 also offers a perfect choice for "Bitcoin Mining" with six PCI-E slots for users who wish to create a dedicated mining machine. With the TB85’s PCI-E slots you get a value oriented motherboard that can be loaded up with graphic cards for mining. For any entertainment needs the TB85 fits the need with support for Direct3D 11.1 and HDMI. It also supports Blu-ray audio DRM and provides the higher audio output of 24 bit/ 192KHz rather than the 16 bit/ 48KHz from typical motherboards.